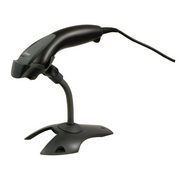 The Voyager 1400g is area-imaging corded barcode scanner built on the platform of Honeywell’s world-renowned Voyager series of hand-held linear scanners. It delivers omnidirectional reading of linear bar codes, plus the ability to affordably upgrade the device to enable PDF and 2D bar code scanning—at the time of purchase or as scanning needs evolve. Performing at speeds that are comparable to laser-based scanners, the versatile and reliable Voyager 1400g can be customized to meet current and future scanning needs, lowering the total cost of ownership. The Voyager 1400g enables PDF and 2D bar code scanning without extra value-added features, such as advanced image capture and processing applications, allowing Honeywell to offer 2D scanning at an attractive price. At the same time, it’s a very reliable and competent instrument for enterprises that require the versatility of area-imaging technology today or may need it in the future. Upgraded with Data Matrix Protection Plugin (DMPS Plugin) by 2DTG, Voyager 1400g becomes effective tool for product authentication and brand protection – ideal solution for retailers. The Voyager 1400g features IP42 seal and its rubberized hood protects the scanner from bumps with products and also reinforces the Voyager 1400g to withstand 5-foot drops to concrete. It ships with a 5-year warranty standard. The Voyager 1400g ships pre-configured in few configurations, ensuring you only pay for the features/options you need. Software upgrades can be added (uploaded) only to “2D configuration”.